Lloyd and Lois Piercy are the second owners of this 3,600 acre, 1865 Cunha Ranch, Echo, Oregon. Purchased in 2002, they knew immediately the bluffs were a perfect terrain for wine grapes. The 39-acre vineyard was established in 2004 with these varieties: Tempranillo, Petit Verdot, and Cabernet Sauvignon. In 2005, blocks of Muscat Canelli and Orange Muscat - Zinfandel in 2006 - and in 2009, Pinot Noir and Carmènére were planted. 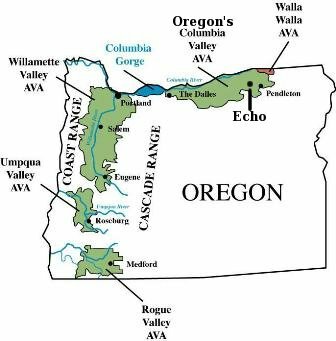 Estate Echo West Ranch & Vineyard sits in Oregon’s Columbia Valley AVA (American Viticulture Area), Echo, Oregon. 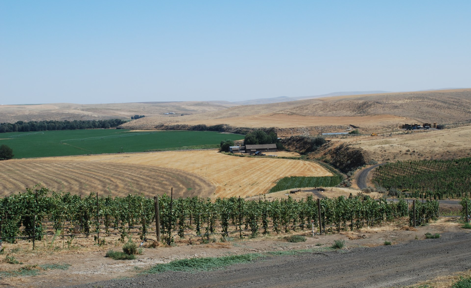 Its wind swept and sunny Southeast slopes perch on the bluff overlooking the Umatilla River. The steep terrain at 850-foot elevation with deep volcanic ash make a unique terroir for growing hardy, full-flavored grapes.